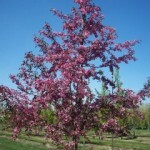 An upright spreading tree with deep purple cutleaf foliage. The first leaves that emerge in the spring are frequently not cutleaf. Fall color includes some orange and yellow. 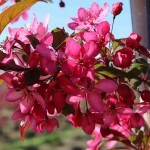 The bright pinkish red blossoms in spring are followed by persistent red fruit. Good disease resistance. 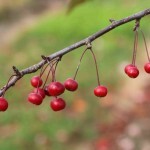 It grows best in full sun in a moist, well-drained soil. 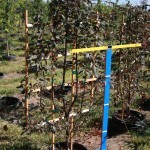 We produce them in tree form and on a trellis. PP 14,375.